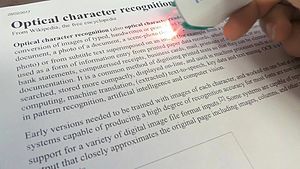 How Does Optical Character Recognition (OCR) Work? | Industry Analysts, Inc.
OCR (optical character recognition) is the recognition of printed or written textcharacters by a computer. This involves photoscanning of the text character-by-character, analysis of the scanned-in image, and then translation of the character image into character codes, such as ASCII, commonly used in data processing. This article was shared on Twitter by Umango. Umango is a global leader in the development of document scanning, file conversion and imaging software. Click here to learn more.